Become a partner and support the museum today. Our members and Winners Circle. The NHRA Motorsports Museum is a 501 c3 non-profit organization and all donations are tax deductible. $5,000 in underwriting toward the Holley National Hot Rod Reunion. $5,000 in underwriting toward the California Hot Rod Reunion. Beyond the benefits your sponsorship will elevate the profile of these special museum fundraising events. It is our goal to count on you as a yearly contributor to one of these or both events. Sponsorship contributions and benefits would be adjusted per yearly agreement to encourage a growing partnership and benefit for both NHRAMM and you as our sponsor. You would receive All Access Live Streaming and Video on Demand. GVM logo bannering in a prominent placement. Naming of such broadcast to be mutually agreed upon. Bannering. You may display banners at the Raceway during the Reunion, with locations, numbers of banners and other particulars pursuant to NHRAMM’s and the Raceway’s then-current bannering guidelines. Your logo would be used on the Winner’s Circle backdrop. You shall receive a minimum of four (4) public address announcements to be made daily during the Reunion promoting Company’s sponsorship of the Reunion. Company, subject to the advance, written approval of NHRAMM may provide written copy to be included in such announcements. Announcements need to be submitted to Museum prior to event date. You are entitled to a minimum of 30 feet deep by 80 feet wide display space on an aisle to pits location between the cacklefest and nitro pits as mutually agreed upon. All tent rental and equipment if applicable will be the responsibility of the Company. You will recieve one full-page color advertisement in the Reunion souvenir program. To meet its publication deadlines, you agrees to provide ad materials no later than June 1, 2018. The Museum has granted inside cover premium placement. Advertising and post event coverage. 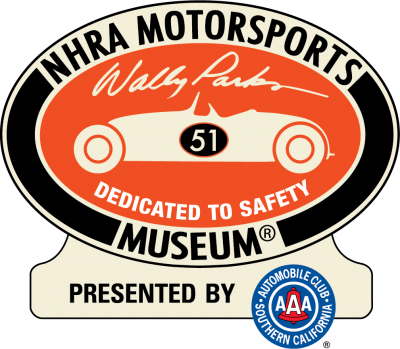 You will receive pre-event announcement of sponsorship on NHRAMuseum.org, NHRA.com, and Museum Social Media sites. Post event coverage, the Company will be mentioned in all media coverage directly of the Museum’s control. You may provide a premium of reasonable size to be included in the “goody” bags being assembled by NHRAMM for spectators at the Reunion. All premiums are subject to the advance written approval of NHRAMM. You are allowed to provide an exclusive race participant “Goodie” bag containing, but not limited to, Good Vibrations Motorsports decal and contingency sponsor information to be distributed at the Racer’s Waiver trailer.